Storms and snow have depleted bee populations, but it may not entirely be a bad thing. EXPERTS HAVE WARNED that extreme weather over past year has taken its toll on Ireland’s bumblebees, with populations estimated to have reduced by up to 40%. Ireland is currently experiencing its hottest summer since 1976, with the heatwave just the latest in a series of unusual weather events to hit the country since the start of the year. In February, the Beast from the East brought snowfall and sub-zero temperatures on a cold front from Siberia, before Storm Emma brought more blizzard conditions just days later. A long thaw eventually gave way to fresher conditions until the beginning of the summer, when Storm Hector lashed Ireland with gale force winds of up to 125km/h in June. And according to Dr Tomás Murray, senior ecologist at Biodiversity Ireland, such conditions haven’t helped Ireland’s bumblebees after what was already a poor 2017. “Last year happened to be a particularly bad year for bumblebees, one of the worst in years,” he told TheJournal.ie. “If you have a bad year the previous year, there’s going to be less queens going into hibernation and emerging in the spring. “A combination of forces hit as queens were emerging from hibernation. Anything coming out in March wouldn’t have survived those snows. But it isn’t just bad weather that hurts the chances of survival for Ireland’s bumblebees. For queens who have successfully built nests, the recent hot spell has also meant a depletion in resources, as Murray explains. “Much of the food for workers simply isn’t there, and many of the flowers that they can find are in water conservation mode. Despite describing insects as “robust things”, Murray expects the bad weather this year to have a knock-on effect next year. A bad 2017 combined with a bad 2018 means that even less queens will go into hibernation this winter, reducing the likelihood of the population bouncing back in spring. But unless Ireland begins experiencing extreme weather events on a regular basis, there may not be any reason to panic just yet. “This is a once-off,” Murray says. “If it was happening a few years in succession, it would absolutely be quite dramatic. In fact, a reduction in one type of bee population in the short-term may not be an entirely bad thing. In biology, a theory called the ‘Redundancy Hypothesis’ argues that a diversity of species in an ecological unit can help it become more resilient, because it isn’t overly-reliant on a single species. If harsh conditions cause levels of one species to be reduced, others can act as a substitute to maintain the ecosystem while that species recovers. And thankfully, Ireland’s ecology is primed for such a scenario. Murray explains: “A lot of the flowers that we have in Ireland are generous. There are very few flowers that will only accept a single pollenator. However, he also warns that if Ireland begins experiencing warmer summers on a regular basis, bumblebees could still be in trouble. “Bumblebees in particular are cold-adapted bees. They’re big, they’re fat, and they’re furry. While warmer weather would no doubt be welcomed by most of the country, it turns out that there are some drawbacks to having higher temperatures. It isn’t just the use of your hose that you’ll miss if every Irish summer becomes as hot as this one. Email “'Bad year' for bumblebees as extreme weather sees levels reduce by up to 40%”. 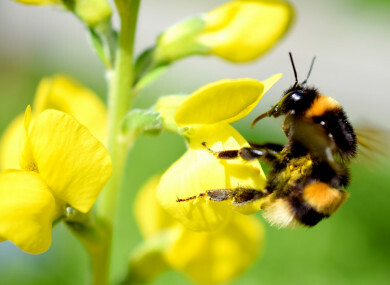 Feedback on “'Bad year' for bumblebees as extreme weather sees levels reduce by up to 40%”.